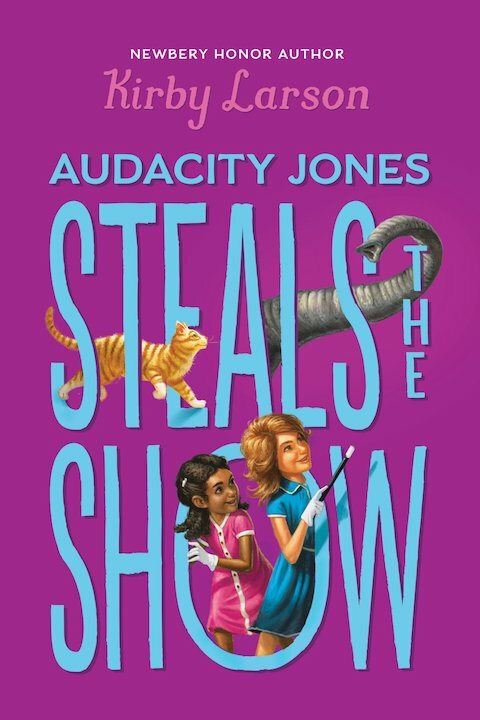 Today sees the release of Audacity Jones Steals the Show, the second Audacity adventure by Kirby Larson. This time the young heroes lend a helping hand to, you guessed it, Houdini! 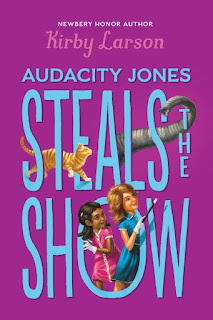 You can purchase Audacity Jones Steals the Show at Amazon.com (U.S.) and Amazon.co.uk (UK). Ron Fortier's Airship 27 has released Holmes and Houdini by I.A. Watson. The excellent cover art has a double Houdini connection. Holmes is modeled on Peter Cushing, who not only played the great detective, but also played Sir Arthur Conan Doyle in The Great Houdinis. They call themselves the Far Edge Club, a mysterious cabal of rich, sadistic hedonists who live only to create pain and fear in others. Just one man has ever bested their perverted schemes, the world renowned magician and escape artist, Harry Houdini. London becomes the stage for their final confrontation. The Club has recruited an army of killers in their maddened goal to destroy Houdini. But they are unaware he is not without his own allies. 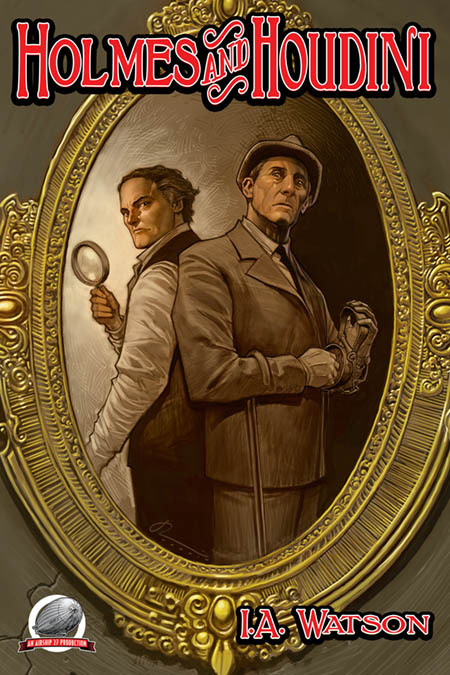 Joining the fray at the American’s side is none other than the Great Detective of Baker Street, Sherlock Holmes, and his loyal companion, Dr. Watson. Together these exceptional heroes will battle an insidious evil and attempt to solve the mystery of the Ghost Mask of L’Inconnu. Writer I.A. Watson delivers an incredible adventure mystery that will keep readers up till the wee hours of the night. Homes & Houdini is New Pulp fiction at its finest. This is Airship 27's second Houdini release. 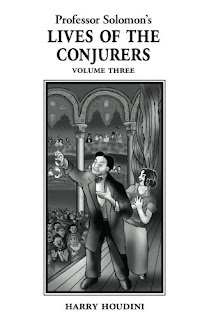 In 2015 they published a collection of "new pulp" stories called The Amazing Harry Houdini. 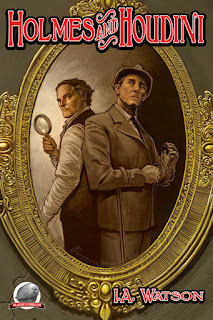 You can purchase Holmes and Houdini from Amazon.com (U.S.) and Amazon.co.uk (UK). Both pages show a July 2 release date, but it's actually in stock now (my order has shipped). You can also buy direct from Airship 27 Hanger. LINK: "The 3 most famous names in history are Jesus Christ, Sherlock Holmes, and Harry Houdini"
Garson O’Toole's clever blog Quote Investigator today tackles a quote by George Bernard Shaw who identified the three most famous names in history as "Jesus Christ, Sherlock Holmes, and Harry Houdini." But did Shaw really say it? Did someone else? Did anyone say it? Click the headline and have a read. 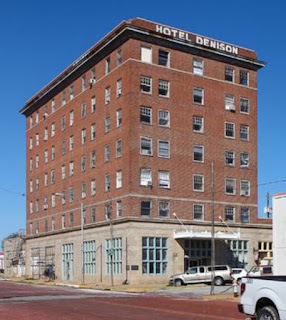 The Hotel Denison first opened its doors at the corner of Chestnut and Burnett in October 1924 as the Simpson Hotel. This followed a fire in 1920 that destroyed the original Hotel Denison. In the Oct. 14, 1924 edition of the Denison Herald, famous illusionist and escape artist Harry Houdini was quoted as saying "nowhere in my travels have I found a hotel any better equipped and with better accommodations" about the Hotel Denison. The hotel continued to offer daily rates until 1986, when it shifted to monthly rental rates. 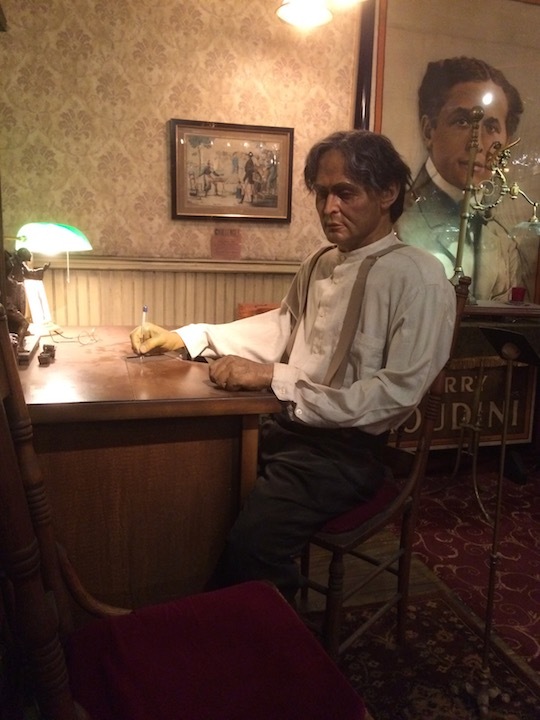 Houdini was in Denison during a seven-day tour of Texas with his spiritualism lecture in 1924. It was at this time that he infamously appeared at a Ku Klux Klan Auditorium in Fort Worth (although not at a Klan event). These were his last appearances in Texas. So was this really the best hotel Houdini ever stayed in, or was he just giving the new hotel a friendly plug? 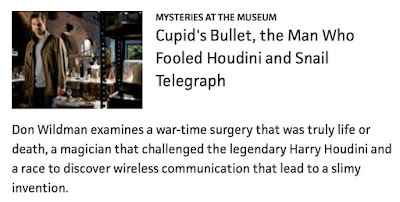 Another Houdini mystery! Reader Bruce East recently alerted me to a connection between Houdini and Coca-Cola that I've never heard before. The following comes from the book The Real Ones: the First Family of Coca-Cola, which discusses Asa Candler Jr., a.k.a. 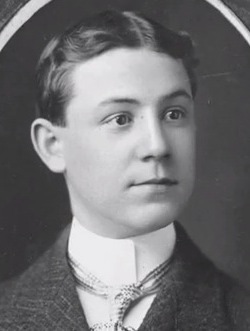 "Buddie," son of Coca-Cola founder Asa Candler, Sr., and his interest in magic. Buddie had learned the tricks from Houdini with the promise to the master magician that he would never divulge them, and he never did. The other magician that Buddie knew well and admired was Howard Thurston, who was famous as a card manipulator and also for his large stage illusions such as the "floating lady." It was from Thurston that Buddie learned and purchased some of the illusion acts he proceeded to perform -- usually using his daughters, Helen and Martha, as his assistants. 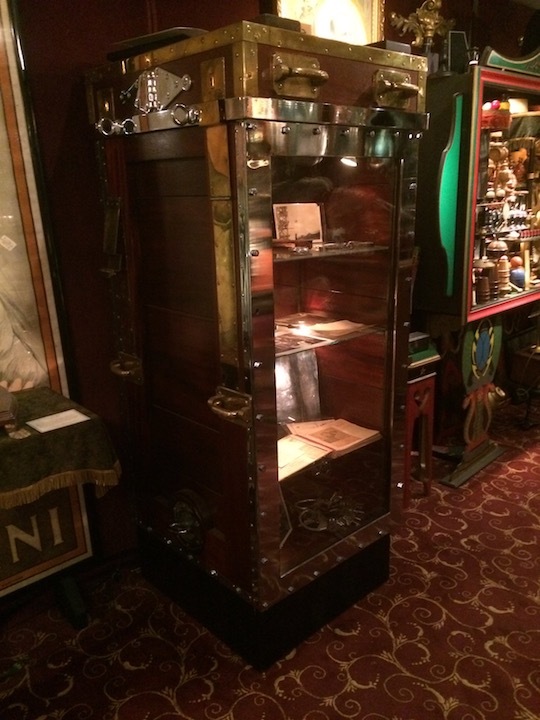 Buddie kept these elaborate magic boxes stored in the ballroom on the third floor of Briarcliff. He could cut a person in two or make them disappear and then return whole, plus many other tricks. Houdini and Coca-Cola. The real thing indeed. Below are links to more connections between Houdini and famous American brands. 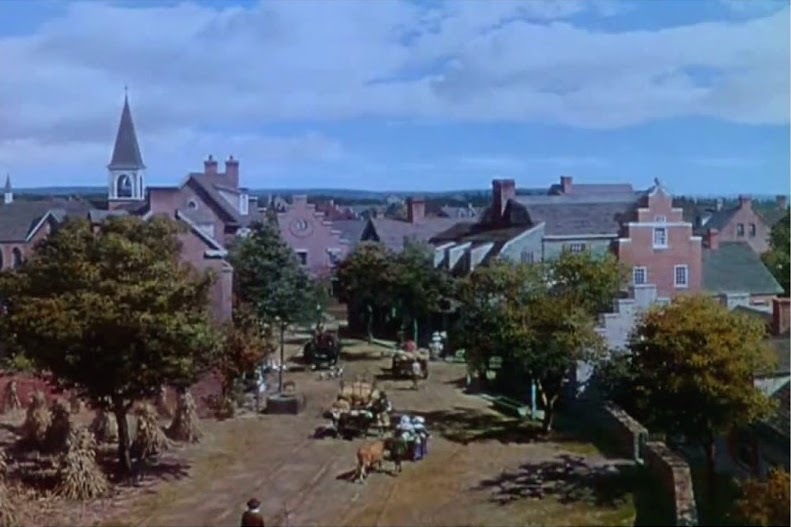 Before computer generated imagery (CGI), physical "matte paintings" were used in movies to create larger spaces and landscapes where there was none. 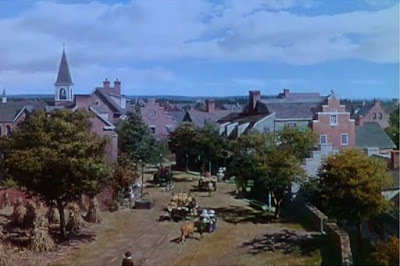 The blog Matte Shot celebrates the lost art, and in post last year shared "a mammoth amount" of golden age matte paintings, including two by Jan Domela for Paramount's 1953 Houdini. While I encourage you to click on over and view the entire post, here are the Houdini mattes as seen in the film. 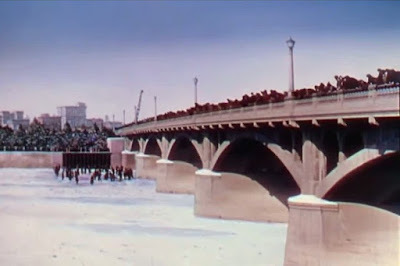 The first painting will be recognizable as the opening shot of Houdini's overboard box escape in the frozen Detroit River (1:19). Less recognizable the second image, which was used during the first "European success" montage (1:02). Thanks to Peter at Matte Shot for letting me share these and to Bill Mullins for the tip. Did Bess know the secret of the "death drop" -- that it was not Houdini in the crash? What caused The Grim Game plane crash? Last week I had the great pleasure of visiting the workshop of master illusion builder all around good guy John Gaughan. I went with Joe Posnanski, a National Columnist for NBC Sports and New York Times bestselling author of Paterno, who was in town researching a new book on Houdini. 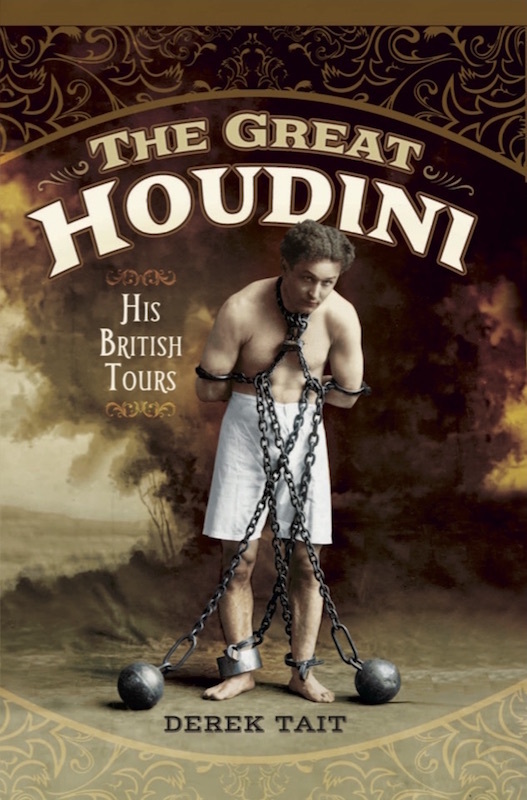 Joe's book will take a look at "Houdini and his impact on the today's world" and will be released in 2018. Definitely one I'm excited about, especially after getting to know Joe. 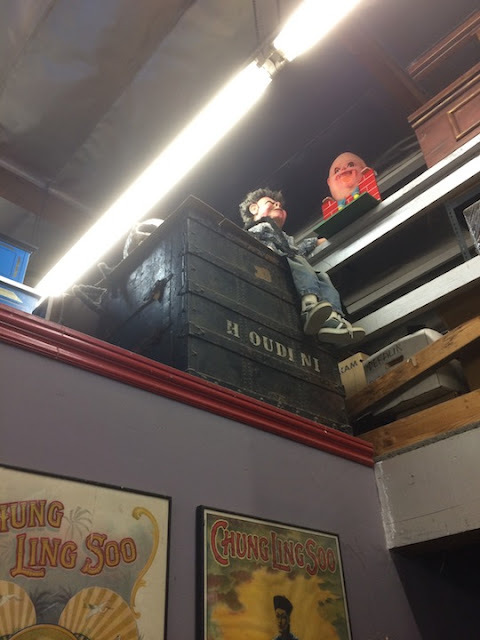 Hey, look, there an original Houdini traveling case up there! When we were leaving, John uncovered his working Water Torture Cell. This was originally made for the 1980 film The Escape Artist. It has since appeared in numerous television projects, including Young Harry Houdini. When the weather warms up, John offered to fill it and put me inside. Yes, please! A big thanks to John Gaughan for the fantastic visit, and to Joe Posnanski for a great day talking non-stop about Houdini. 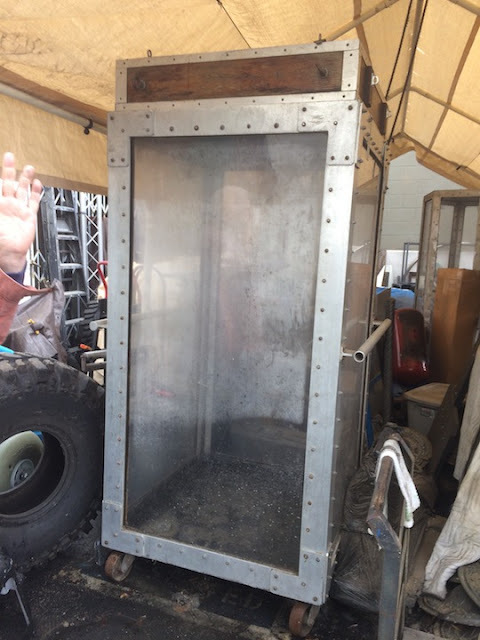 You can read about my first visit to John's shop, which included a nice Water Torture Cell surprise, HERE. 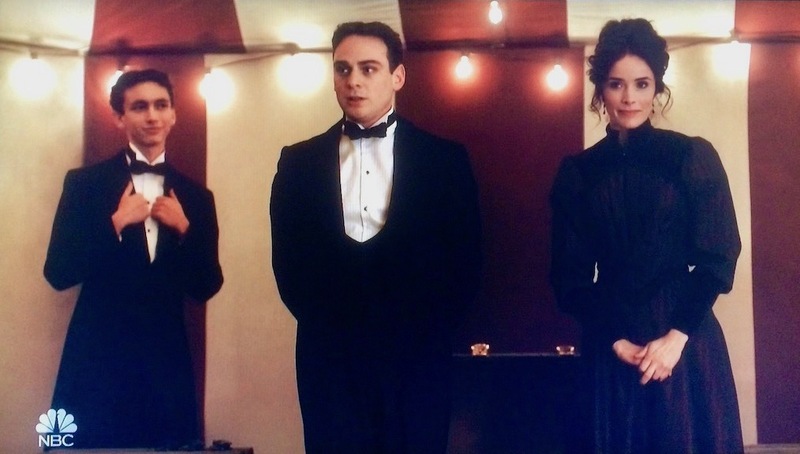 Houdini appeared on the NBC series Timeless last night in an episode called "The World's Columbian Exposition" set during the 1893 Chicago World's Fair. It was great fun. Actor Michael Drayer played the young Houdini as fearless, resourceful and heroic. The episode also contained a few surprises, including an appearance by Dash played by Leo Beckwitt (now the 6th actor to portray Hardeen on screen), and even a mention of Bess; a heads-up for Harry from our time travelers. For those who missed it, the good news is the full episode is available on the Timeless page at NBC.com through May 25, 2017. 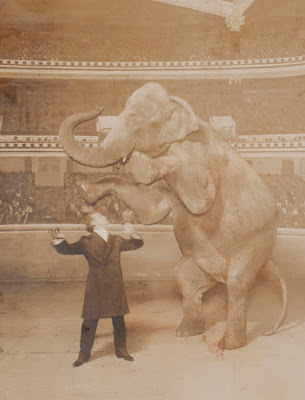 As far as the history goes, Houdini did indeed perform at the Columbian Exposition in 1893 at the start of his career, although it was with his first partner Jacob Hyman and they were billed as The Brothers Houdini. The set designer created some mock-up posters based on King of Cards and Metamorphosis, mixing in images of Houdini from later in his career. Houdini being forced to unlock a door at gunpoint reminded me to his Coffeyville exploit. And for those who felt bad for Harry when Lucy rejected his proposal to "team up" at the end, know that Bess will come into his life the following year (1894). The episode also featured Thomas Edison, Henry Ford, J.P. Morgan and serial killer H.H. Holmes. But Houdini was clearly the favorite of the team. Timeless is about a team of time travelers who protect the present in the past. It airs on NBC on Mondays at 10/9c. 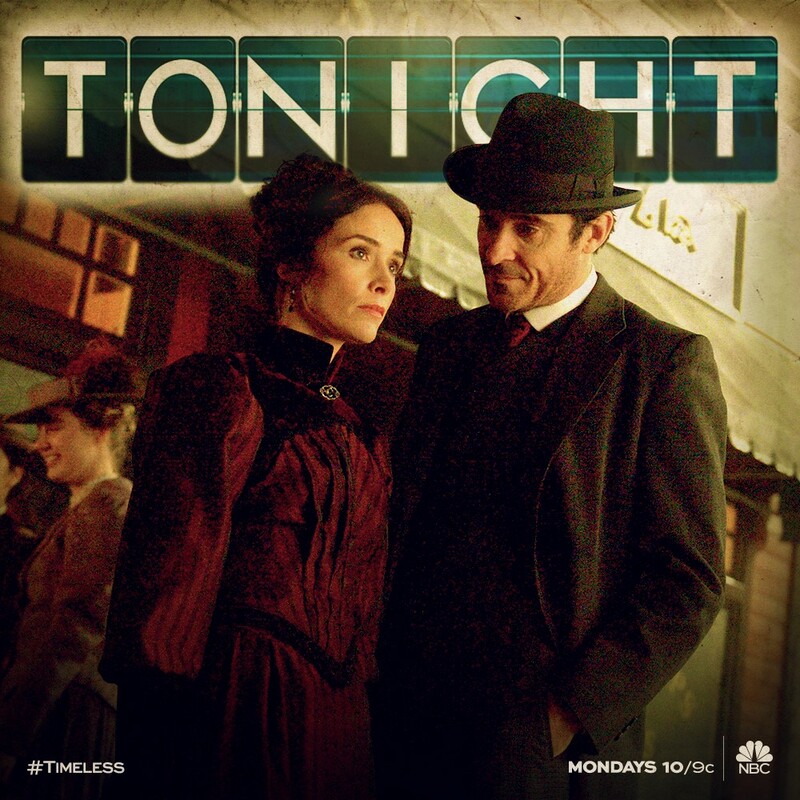 Just a reminder that Houdini will appear on the NBC series Timeless tonight at 10/9c. The episode is called "The World's Columbian Exposition" and is set during the 1893 Chicago World's Fair. 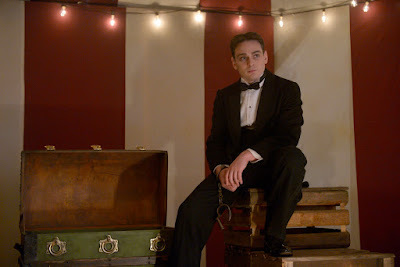 Houdini is played by Michael Drayer. Timeless is about a team of time travelers who protect the present in the past. Episodes have featured Abraham Lincoln, Benedict Arnold and Bonnie & Clyde. Check out this image of Houdini with Jennie his vanishing elephant on stage at the Hippodrome theater. This comes from Houdini's The Adventurous Life of a Versatile Artist pitchbook and is an image that we are all familiar with. Or is it? Now look at the image below. This is actually the familiar photo we see in books, etc., and it's pretty clear that it's not the same image as the above. Houdini is in a very different position. However, Jennie is in the exact same pose, although she's in a different position in relation to the background. That means she's one well trained elephant, or this famous shot is not what it seems. I've always looked this photo with some skepticism. 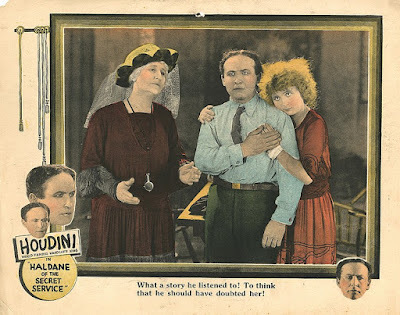 Not only does it seem like an improbable moment to capture on camera, but the light on Houdini, Jennie, and the cavernous Hippodrome does not seem achievable. The Hippodrome appears to be a backdrop. But is Jennie herself artificial? That is not as clear to me, but these two photos seem to suggest that she is. 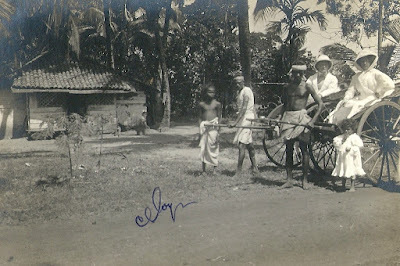 This photo is credited to the famous White Studio, and was likely taken in the studio itself. In the un-cropped version one can see a person standing just off the edge of frame. The audience directly behind Jennie's right foot also appears to be painted, possibly onto the negative itself. So what's going on here? Break out the magnifiers! No matter how the photo was created, it's still a great shot, and it's exciting to see an alternate version (which has been hiding in plain sight). 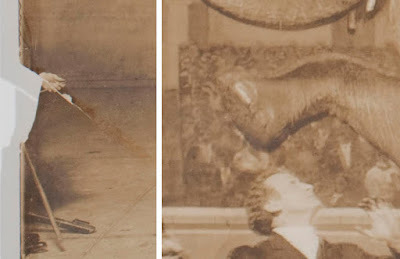 These two images remain the only known photos of Houdini's vanishing elephant illusion. Thanks to Perry from New Jersey for bringing this photo to my attention. 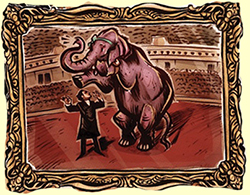 UPDATE: Reader David Tank has created in the below animated gif which appears to show that the elephant did move. Interesting. Thank you, David! Some of you will remember Kevin Mitnick, the infamous hacker who evaded the FBI for years before finally being arrested in 1995. While watching the 2016 documentary Lo and Behold, Reveries of the Connected World, I discovered something about Mitnick that I never knew. Check out the clip below. Cool Harry Houdini tribute on Google ;-) Houdini rocked! Lo and Behold, Reveries of the Connected World can be streamed on Netflix and Amazon Video or purchased on DVD. Here's a unique one. 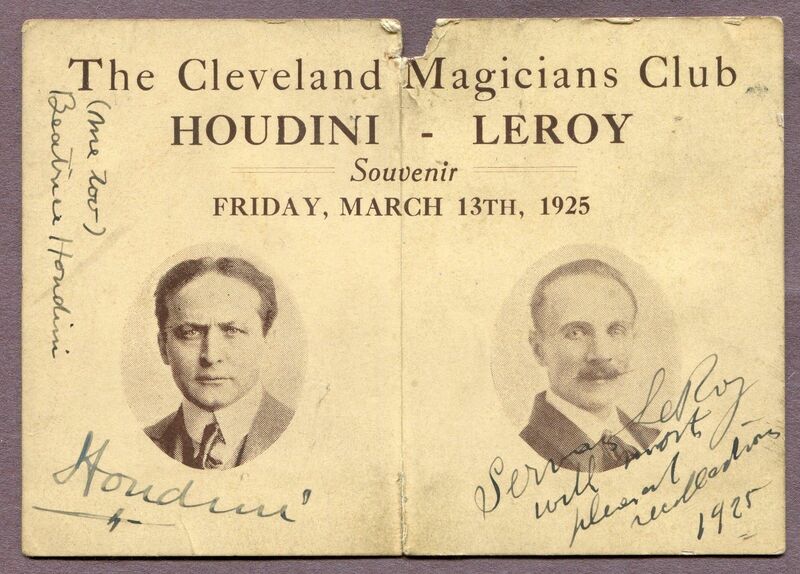 This souvenir card from a 1925 Cleveland Magicians Club event with Houdini and Servais LeRoy sold on eBay over the weekend for $2,080. The card is signed by Houdini, LeRoy, and Bess "(me too)." Houdini was performing at the Palace Theater in Cleveland at this time. Seller description: For your consideration is this rare original signed card from the Cleveland Magicians Club featuring Harry Houdini and Servais LeRoy. LeRoy was a Belgian magician, illusion designer and businessman. He was credited as the inventor of the classic levitation illusion called Asrah the Floating Princess. He performed for many years in Belgium, London, and the US, among other places. He was a true innovator and inventor in the field of magic. It is rare to find signed Le Roy items, but in combination with Houdini's and Bess's signatures, this makes this a historic and likely a one of a kind piece of history. It would make a fantastic addition to your collection. Well, it appears it did make a fantastic addition to someone's collection! (Our friend Dale from Cleveland perhaps?) Congrats to the winner. 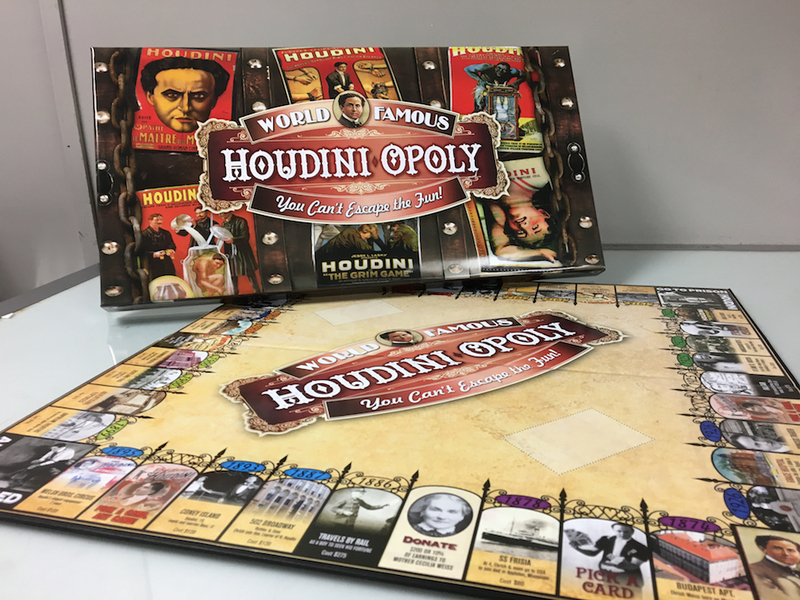 Check out this excellent article by Jackson Landers about Houdini the inventor. The piece includes some good observations by Teller and a few scatterbrained quotes from yours truly (I need to get better with phone interviews). It also includes some very nice photos from National Air and Space Museum Archives, including the infamous "photo Houdini didn't want you to see." 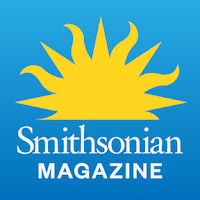 Click the headline to read at Smithsonian.com. Tony Oursler's Imponderable exhibition at MoMA in New York City, which had been scheduled to close on January 8, has now been extended to April 16. On display is Margery's original seance kimono and chair from the Libbet Crandon de Malamud Collection. This is the first time these rarities have even been publicly shown. 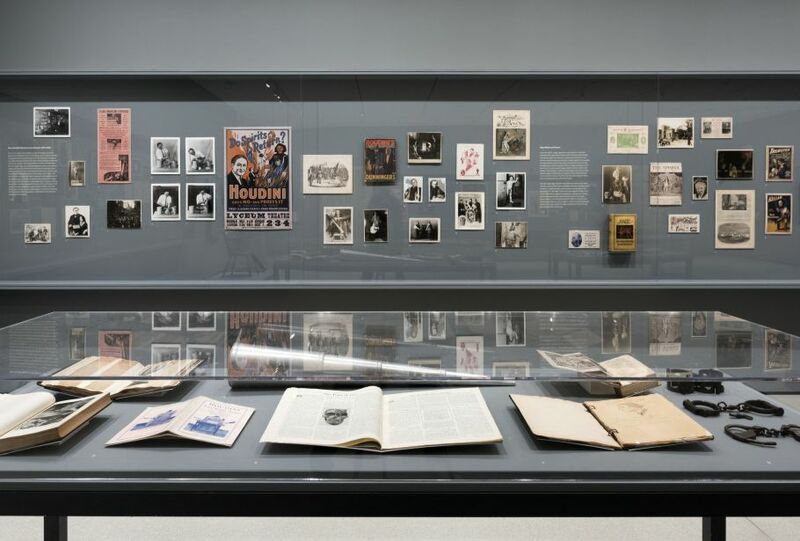 The exhibition also includes some cases of Houdini memorabilia. Tony Oursler is the grandson of Houdini's friend and colleague Fulton Oursler. 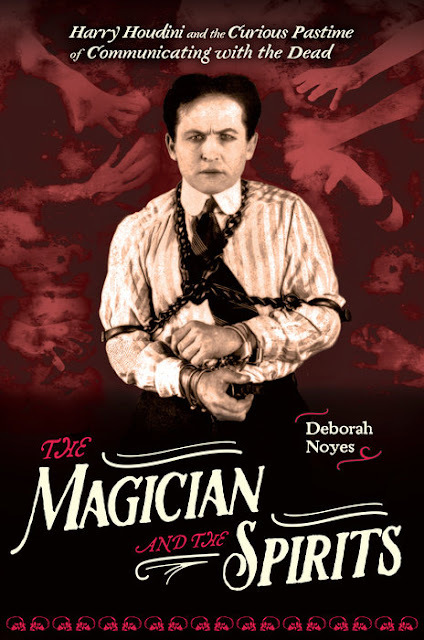 His modernist film Imponderable, which is part of the exhibition, features Houdini (played by Mark Mitton), Sir Arthur Conan Doyle and Margery among others. 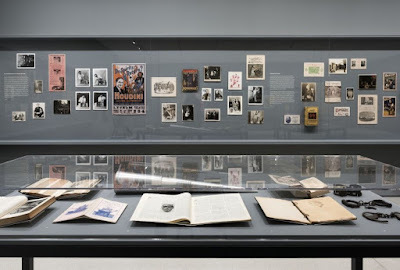 His work and collection also appears in the book Imponderable: The Archives of Tony Oursler. 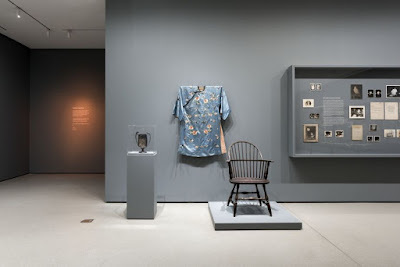 The Museum of Modern Art (MoMA) is located at 11 West 53 Street, New York, NY 10019. For more info visit their website. The mighty Arthur Moses alerts us to issue No. 4 of the UK publication Bringing History To Life which contains 4 pages on "Houdini's Best Tricks." What...they couldn't get Houdini on that cover? Or is that "Yar the Primeval Man"? Memo to magazine editors: Houdini sells! This came out last year so it might be a trick to find. But you can start at the website Newsstand. Over the Christmas break the collected edition of Adam Glass's ROUGH RIDERS was released by Aftershock Comics. Also came news that there will be a second series, ROUGH RIDERS: RIDERS ON THE STORM, starting in February. Below is a description. 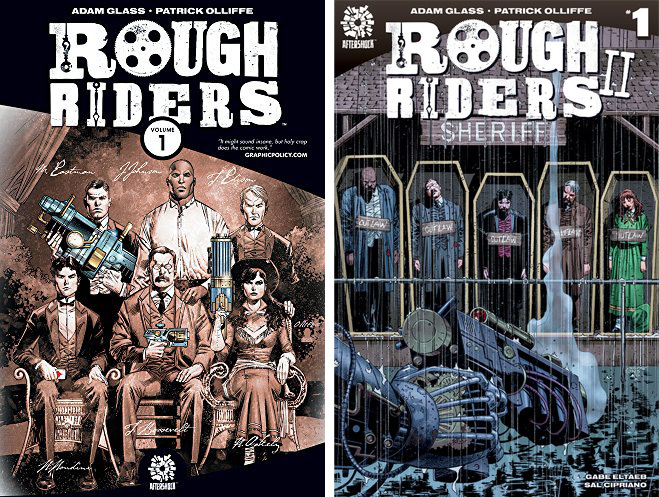 The trade paperback edition of ROUGH RIDERS Vol. 1 can be purchased at Midtown Comics. 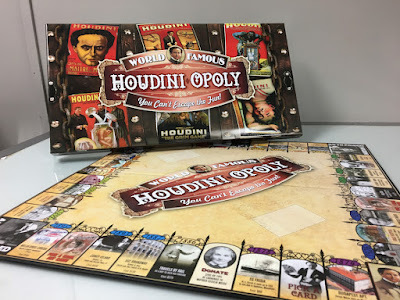 Somewhat lost amid all the activity around the 90th anniversary of Houdini's death was this very good article by Kevin Coffey in the Omaha World Herald about Omaha's relationship to Houdini and other famous figures in magic. 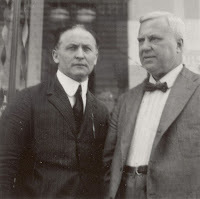 Among them is David P. Abbott, pictured here with Houdini in the 1920s. 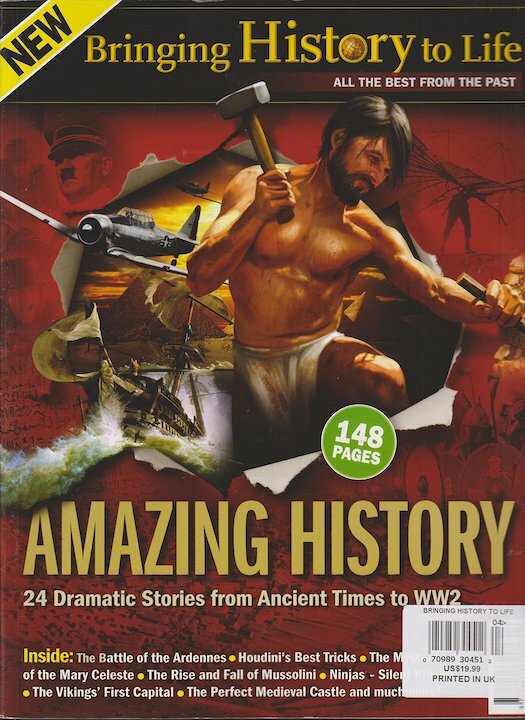 Tags: [History], Links, Other magicians, S.A.M. 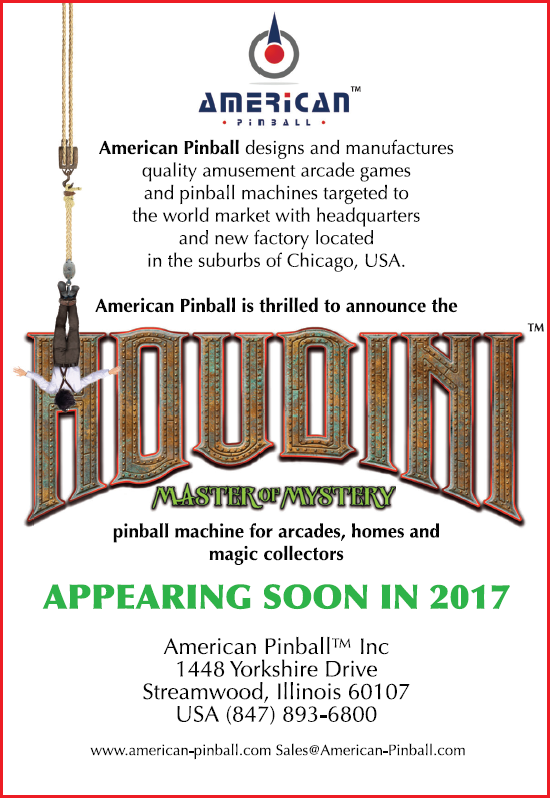 American Pinball, makers of the upcoming "Houdini Master of Mystery" pinball machine, have updated their Facebook with the following image and message. It appears they have "started fresh" on a new design, so what was shown in Las Vegas and Chicago last year will not be the final game. Happy Holidays everyone. As the new year is upon us we too have something to be grateful for. 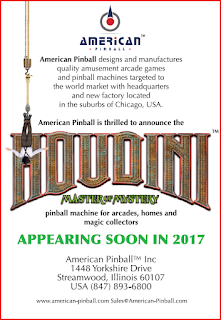 We're happy to say that we've made some great progress on Houdini, our first original pinball machine. The rumors are true, we have started fresh, from the ground up, with our new team and reimagined the game in ways we never thought possible. While it's too early for pictures to share just yet, we felt it was important to share that our American Pinball team is growing and we're proud to say that we've added some well-respected experienced pinball professionals to our American Pinball family. Thanks for all your support so far and please keep a look out for more details and another update later this week. The Travel Channel's Mysteries at the Museum will once again feature a segment about Houdini. The new episode will air January 12. No firm details yet, but from the description, I'm guessing this is about Houdini and Dai Vernon. 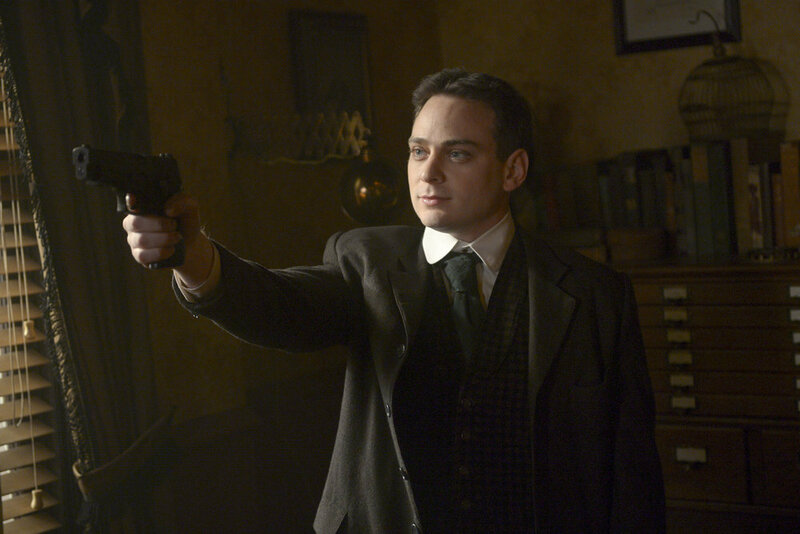 This marks Houdini's fifth appearance on the show. Other episodes have explored the Mirror challenge, Margery, Conan Doyle and Eleanor Fletcher Bishop. Hey, that's enough to put together a full Houdini episode, isn't it? Ideas. Having scored success at the 2016 Edinburgh Festival Fringe, Nick Mohammed's Mr. Swallow - Houdini will play London's Soho Theater Jan. 10 through Feb. 18, 2017. Having only just touched back down to earth following the success of his spectacular run at the 2016 Edinburgh Festival Fringe, Mr. Swallow returns to Soho Theatre with Mr. Swallow – Houdini, the self-proclaimed first-ever entirely true auto-biopic of legendary magician Harry Houdini. Forget William Kalush and Larry Sloman’s painstakingly researched 608-page book The Secret Life of Houdini (IT. IS. BOR-ING.) Forget hours of trawling Google (whatever happened to Encarta 97?) Mr. Swallow – Houdini will be a world-first celebration of the man who brought magic and escapology to the mainstream. For more information and to buy tickets visit the Soho Theater website. You can follow Nick Mohammed on Twitter @nickmohammed. Welcome to another year of WILD ABOUT HARRY. Let's kick off 2017 with a look back at what Houdini himself was up to 100 years ago. Quick! 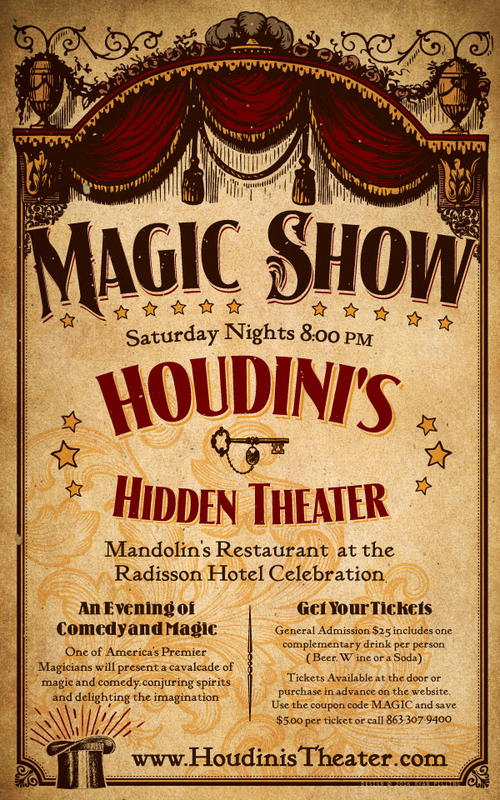 Name a significant Houdini escape, piece of magic or performance associated with the year 1917? One can easily do this for nearly every year of Houdini's life: 1903/Carette; 1908/Milk Can; 1914/Walking Through A Brick Wall. But 1917 is tricky. That's because for the first time in many years, Houdini didn't invent or perform any new escape or feat of magic. In fact, his act was basically the same one he had been doing since returning to the U.S. in 1914. Of this period Silverman writes: "Much of what had brought Houdini to this height he was now preparing to downplay or abandon." But in regards to his significance and impact on the magic community, 1917 might actually be the most significant year of Houdini's life, and it's why the year appears on his Machpelah monument. But we'll get to that. 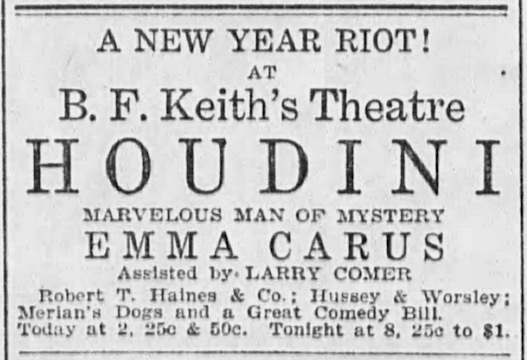 Houdini kicked off 1917 in Philadelphia, heading up a Keith's bill advertised as "A NEW YEAR RIOT!" 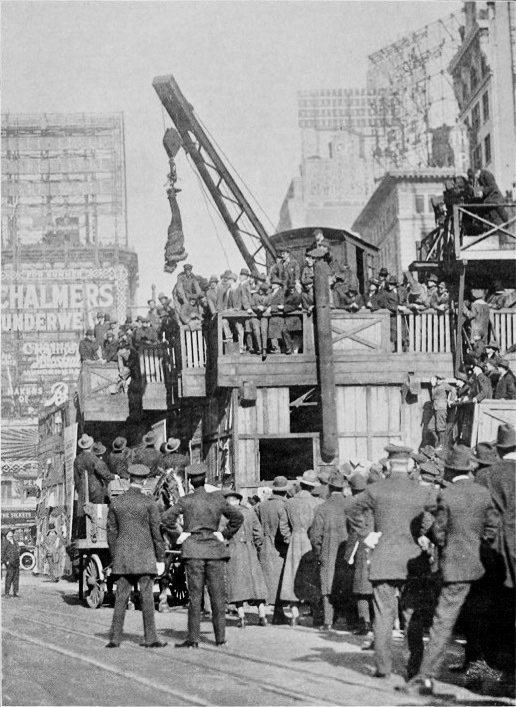 Houdini's January 1st show drew capacity crowds who saw him escape from his Chinese Water Torture Cell. The Philadelphia Inquirer enthused, "It is really the most uncanny trick of any that he has offered here and would impress one with the belief that this modest little fellow is gifted with superhuman powers, although he disclaims any such thing." 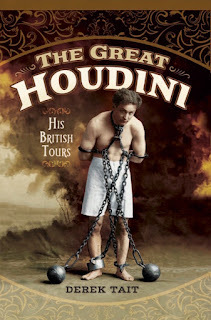 Houdini then returned to New York and played the Orpheum Theater in Brooklyn and the Alhambra in Manhattan. It was during this time that he played a different kind of hero role. Acclaimed French actress Sarah Bernhardt had been presented with a bronze statuette of herself on behalf of the "Actors of America." She then received a second surprise; the bill for $350 ($7,136 today). She returned the statuette to everyone's embarrassment. 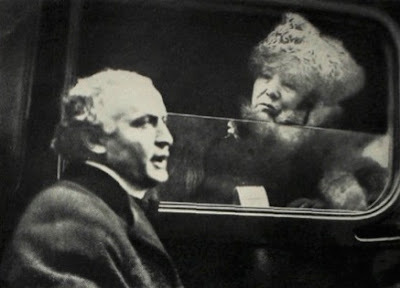 Learning of this, Houdini paid the bill and promised he'd return the tribute to the great actress personally. Bernhardt insisted he keep it, but she did reportedly ask if he could use his magic powers to restore her amputated leg. 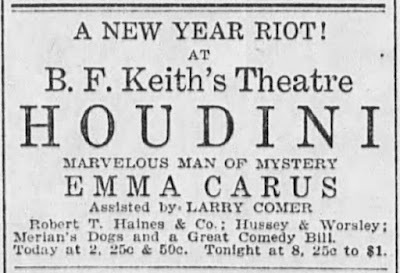 February saw Houdini at Keith’s Theater in Washington, D.C., escaping a wet-sheet "Lunatics' Bed" provided by the Government Hospital for the Insane. 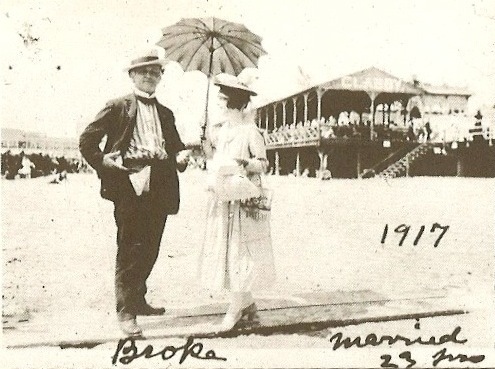 At Baltimore's Maryland Theater he beat a packing box constructed on stage by the Crown Cork and Seal Company. In Boston he hung 100 feet in a straitjacket from the B.F. Keith’s Building on Tremont St. The outdoor stunt was witnessed by his new friend The Divine Sarah. Houdini and Sarah Bernhardt in Boston. Houdini kicked off March by accepting a challenge from the Boston Athletic Association to escape from a straitjacket and packing crate at the same time. In Providence he did a suspended straitjacket escape from the Brownell Building at Exchange Place. 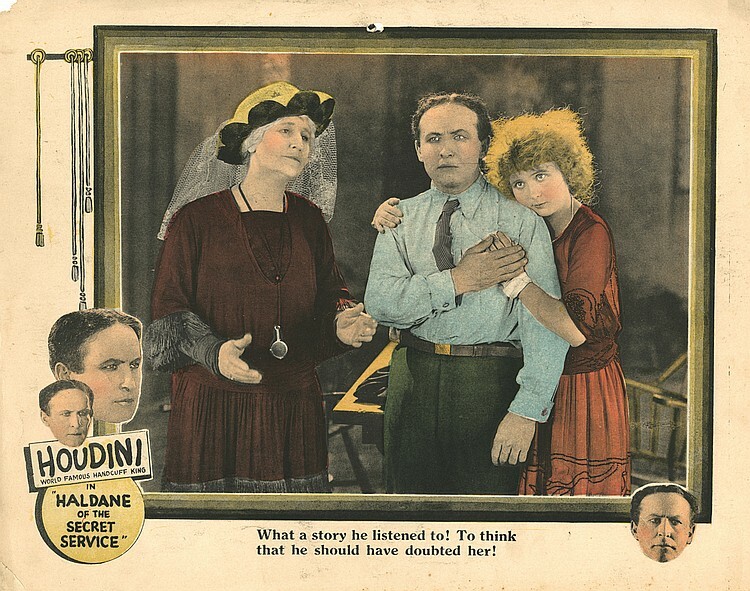 Then in April came news of a dramatic development in Houdini's career. He would make a movie! And not just any movie. It would be a land, air and undersea spectacular for which he would receive the highest salary ever paid to an actor for a single film. The movie would be produced by the Williamson Bros., specialists in underwater photography, and was due to shoot in the Bahamas in May for release in November 1917. The movie never materialized for reasons unknown. Some have suggested that America's entry into the war scuttled plans for the international shoot. But the idea of Houdini as a movie star was now out there. It was just a matter of finding the right vehicle. Houdini had actually already entered the movie business, behind the scenes, a year earlier with his Film Developing Corporation. But the business was proving to be a struggle, and in early 1917 Hardeen announced his retirement from the stage to help run the company. The stress would give him ulcers. It may not have helped that the Houdinis were still living with the Hardeens in Flatbush at this time. On their regular anniversary visit to Coney Island in June, Harry playfully posed beside Bess with his pockets turned out and wrote the word "Broke" on the photo. While not broke, the FDC and related business ventures were a serious drain on the fortune he had amassed during his career. 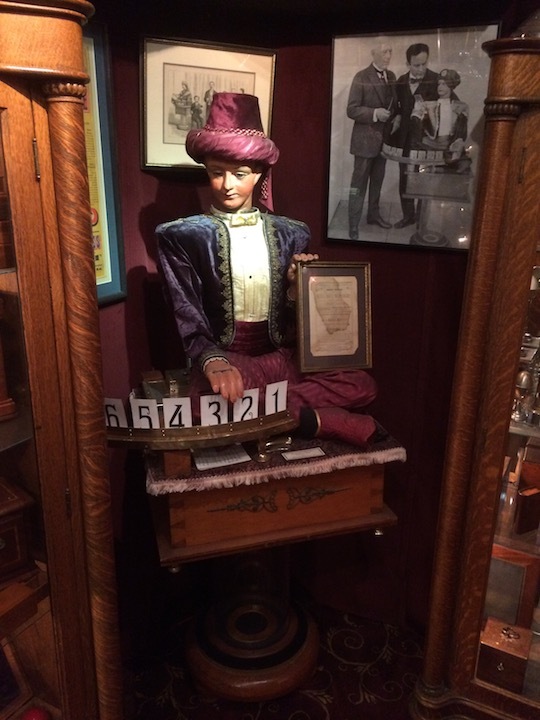 But Houdini was still flush enough to make several major purchases for his growing Dramatic collection, as well as a writing desk said to have belonged to Edgar Allan Poe. On June 2, 1917, Houdini became president of the Society of American Magicians. Houdini had left the S.A.M. in 1908 due in part to his feud with Dr. A.M. Wilson. Four years later, the S.A.M. voted to make him an honorary member. But Houdini considered the S.A.M., which met in Martinka's magic shop in New York, old fashioned and unambitious. So along with past president Oscar Teale, he set out to reshape it. Houdini had long dreamt of a magic organization modeled on fraternal orders like the Masons. He first tried this by founding the Magicians Club in the UK with Will Goldston. Now Houdini envisioned the S.A.M. as that great nationwide Order. He personally solicited magic clubs all over the country to join the S.A.M., whose motto was "Magic - Unity - Might." Where there were no clubs, Houdini brought together groups of magicians to form S.A.M. Assemblies. "This is the biggest movement ever in the history of magic," he enthusiastically wrote to Teale. Houdini and Teale worked for a year to build the new national S.A.M. For good measure, Houdini purchased Martinka's magic shop. His election as president was the culmination and reward for his efforts (Teale became Secretary). His first official act was to call for a council to investigate the entry "Conjuring" in the Encyclopedia Britannica, which failed to mention any American magician (including himself). He also threw a lavish banquet for members at the McAlpin Hotel, gaining the S.A.M. recognition in the New York press. Houdini would reign as president of the S.A.M. for the rest of his life. The organization that he created in 1917 still exists today with over 250 active assemblies. A living tribute to Houdini's vision of a unified magic fraternity. Houdini's M.I. (Most Illustrious) presidency on his grave. 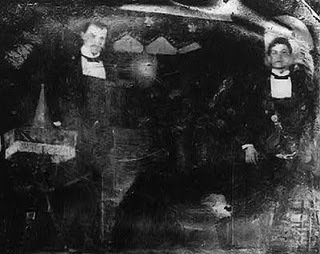 The day before Houdini celebrated his 43rd birthday, his brother Leopold married the ex-wife of another brother, Nathan. This would cause a rift between Houdini and Leo that would never be resolved. But it was what happened on Houdini's birthday, April 6 (the date he celebrated), that was to define the rest of his year. The United States Congress declared war on Germany. Despite his affinity for things German (the family language), America's entry into World War I ignited Houdini's inherent patriotism. When a draft was initiated in June, Houdini marched himself and his assistants to the nearest enlistment office. On his registration card Houdini noted his profession as "Actor - Manager Film Factory." Too old to serve, he nevertheless dropped and did pushups for the assembled recruits. After performing at Keith’s Theater in Atlantic City, Houdini cancelled his Fall tour and devoted himself entirely to the war effort. He toured army camps and performed at numerous Red Cross benefits where he once made an entrance escorted by a company of marines. He gave soldiers lessons in how to escape from German handcuffs and rope ties, and handed out $5 gold pieces he produced during his "Money For Nothing" routine. (By the war's end he had given out over $7000.) He also sold over $1 million in war bonds and committed $1000 of the S.A.M. surplus fund to the war effort. "My heart is in this work," he said. "WE MUST WIN, and that is all there is to it." Regretting that he had given flight lessons to German soldiers in 1909, he destroyed photos showing himself with the soldiers and his biplane. He also relocated much of the history of his early aviation accomplishments to Australia (causing confusion that can still crop up today). Having patented a quick release diving suit (which he planned to showcase in his underwater film), Houdini gave the design to the Dept. of the Navy. The non-smoker also appeared as part of a Hippodrome benefit for The Sun Tobacco Fund. Ads read: "Smoke Up and Help Smoke The Kaiser Out." On October 22, 1917 the Army transport ship SS Antilles was torpedoed by a German U-boat killing 67. Houdini organized a benefit for families of the victims at the Hippodrome. The magic spectacular would see him share the stage with Harry Kellar (brought out of retirement for the occasion), Howard Thurston, Charles Carter and Adelaide Herrmann among others. To promote the charitable event, the city of New York finally granted him permission to perform a suspended straitjacket escape "for the purpose of advertising a patriotic performance." Houdini performed the escape on November 5 in Times Square (then called Longacre Square), dangling 60 feet above 7th and Broadway from a crane being used to construct the new New York subway. In return for the favor of permission, Houdini voiced his support of New York's incumbent Mayor John Purroy Mitchell who was facing reelection the following day. This despite the fact that Mitchell's campaign denounced Jews (among others) as enemy sympathizers. Mitchell lost, and Houdini's Antilles benefit, held on November 11, raised $10,000. Houdini's war efforts took up the remainder of his year. In November he played alongside Irvin Berlin at "Hero Land," where he was un-typically billed as "The Great Houdini." Held at Grand Central Palace, Hero Land was a 60 day grand bazaar of entertainment venues that drew a crowd of over 250,000 and raised over a half-million dollars for war relief charities. 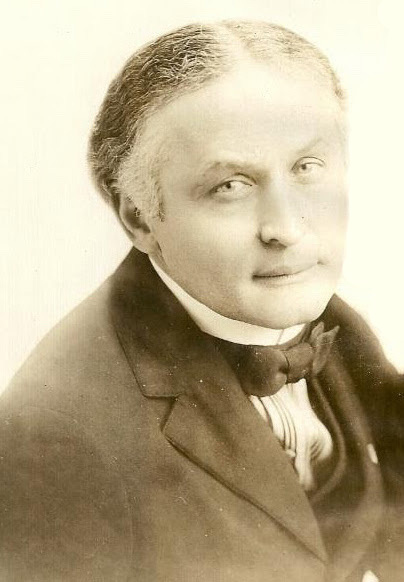 In December Houdini signed a contract to join the Hippodrome revue show "Cheer Up", which was playing its 1917-18 season. 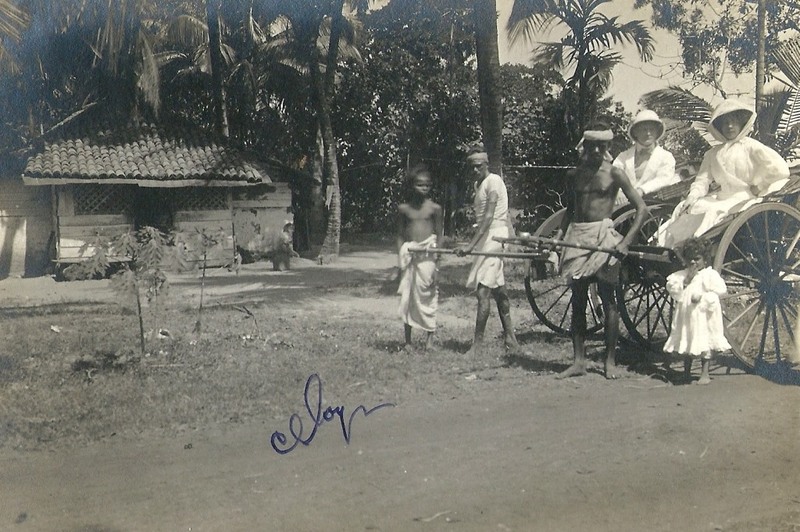 Hippodrome producer Charles Gillingham had been impressed with his staging of the Antilles benefit, and asked him to come up with something spectacular. Houdini would command two acts (called "Cheers"). In one he'd do his overboard box in the famous Hippodrome pool. For the other he would create a new illusion worthy of the enormous Hippodrome stage. Having not invented or introduced any new effects in 1917, Houdini's "Cheer Up" debut on January 7, 1918 would make a gigantic impression. But we'll save that for next year. One hundred years ago Houdini rang in the new year like this.